MIAMI, March 4, 2019 /PRNewswire/ -- To celebrate Dr. Seuss' 115th birthday, Carnival Cruise Line hosted a fun family-friendly event onboard Carnival Splendor in Long Beach for 100 kids from the local Boys & Girls Clubs as part of the fleetwide festivities that commemorated the life of the world-renowned children's book author. The event featured a special reading of "Horton Hears a Who!" by singer, dancer and television personality Joey Fatone. Carnival Cruise Line and Dr. Seuss share an appreciation for fun and creativity, so to honor the famed children's author and the world he created, the event included a breakfast with popular Dr. Seuss characters delighting attendees as they indulged in Green Eggs and Ham, red and white pancake stacks resembling The Cat in the Hat's signature striped hat and other colorful creations, as well as, face painting and other activities. Dr. Seuss' birthday festivities extended across the Carnival fleet and included a balloon drop and moment for birthday cake and sweets on each ship. Carnival also encouraged young guests to write their own birthday wishes and granted 115 wishes across its 26 ships. 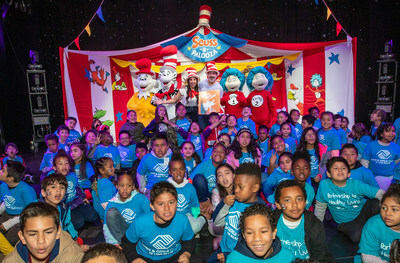 In conjunction with the event and in the spirit of supporting today's youth, Carnival also made a $10,000 donation to the Boys & Girls Clubs of Long Beach, an organization that helps children of all ages reach their full potential through fun and educational programming year-round. These festivities are just one of the company's many ongoing efforts to celebrate the remarkable words and world of Dr. Seuss. Through its fleetwide Seuss at Sea program, an exclusive partnership with leading children's entertainment company, Dr. Seuss Enterprises, Carnival's ships feature activities such as a Green Eggs and Ham Breakfast with The Cat in The Hat and Friends, and Seuss-a-palooza Parade and Story Time, a special onboard character parade and interactive storytelling experience. Dr. Seuss Bookville, a family-friendly, Seuss-themed reading venue, is available on select ships as well with a Dr. Seuss-themed WaterWorks aqua park featured on the line's newest ship, Carnival Horizon. "At Carnival Cruise Line we are all about providing new and exciting ways for our guests to Choose Fun and what a better way to celebrate Dr. Seuss' 115th birthday than with a creative and memorable event honoring the world's most famous children's author and the world he created while making a difference in one of our homeports," said Chris Nelson, vice president of entertainment for Carnival Cruise Line. "Each year, Ted's birthday is a special celebration of his vision to fuel the power of imagination and encourage a lifelong love of learning and literacy in our children and children at heart," says Susan Brandt, president of Dr. Seuss Enterprises. "We were so excited to partner with Carnival Cruise Line once again for Ted's 115th birthday and together honor his legacy by inviting kids to experience the amazing world of Dr. Seuss through fun, celebratory reading events." Carnival is the leader in West Coast cruising industry with three year-round ships that carry upwards of 600,000 guests annually – the most in cruising. Carnival Panorama, currently under construction in Italy, is set to debut from Long Beach in December of this year, marking the first new Carnival ship homeported on the West Coast in 20 years, underscoring the importance of the rapidly growing market. Theodor Seuss Geisel is quite simply the most beloved children's book author of all time. Winner of the Pulitzer Prize in 1984, three Academy Awards, two Emmy Awards, three Grammy Awards, and three Caldecott Honors, Geisel wrote and illustrated 45 books for children. Hundreds of millions of copies have found their way into homes and hearts around the world. While Theodor Geisel died on September 24, 1991, Dr. Seuss lives on, inspiring generations of children of all ages to explore the joys of reading. For more information about Dr. Seuss and his works, visit seussville.com. About Dr. Seuss Enterprises, L.P.
Dr. Seuss Enterprises is a leading children's entertainment company committed to caretaking Theodor Seuss Geisel's (Dr. Seuss's) legacy, ensuring that each generation can experience the amazing world of Dr. Seuss. Established in 1993 and based in San Diego, CA, the company's global portfolio complements the roster of iconic Dr. Seuss books, and includes films, TV shows, stage productions, exhibitions, digital media, licensed merchandise, and other strategic partnerships. Ted Geisel once said he never wanted to license his characters to anyone who would "round out the edges" – a guiding principle at Dr. Seuss Enterprises. For more information about Dr. Seuss and his works, visit seussville.com.